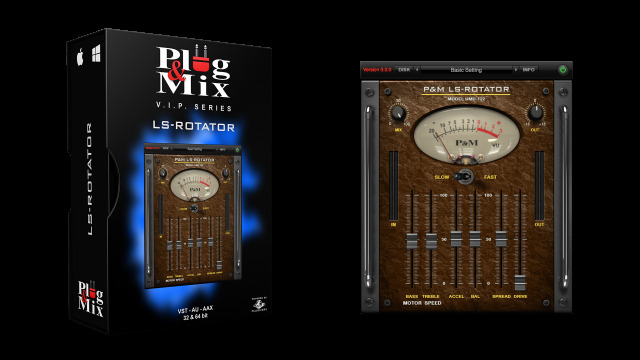 This plug-in gives you the classic sound of a Leslie rotating speaker. The speaker has two elements - the lower and upper rotor. This effect works really well on guitars, keyboards and even vocals sometimes. Add a some drive for a really gritty tone and flip the switch for slow or fast rotation speeds. - MIX : Dry/Wet control. - SLOW-FAST SWITCH : Speed control for the rotating speaker. - BASS : Speed control for the low frequency rotor. - TREBLE : Speed control for the high frequency rotor. - ACCEL : Controls the acceleration of the rotors when changing their rotation speed. - BALANCE : Controls the ratio between the output produced by the lower and upper rotors. - SPREAD : Controls the width of the stereo image. - DRIVE : Controls amount of saturation applied to the input sound.